There are many cleaners in the market with harsh chemicals, strong acids, bleaches, etc. which do kill odour causing bacteria but leave unpleasant smell of their own. They cannot be used with on expensive marble surface, wooden surface, etc. 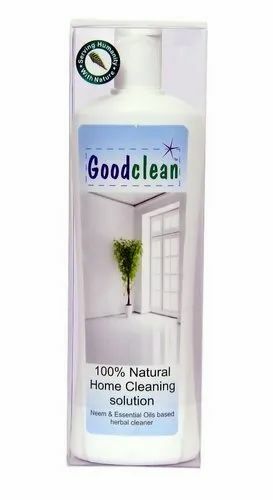 Good clean is the best natural alternative to desirable cleaning for your beautiful home. Natural neem protects from germs, flies and essential oils energizes the environment with freshness. It is also ideal for restaurants, hotel kitchens, large showrooms. Available in 500ml., 2 Liter and 20 liter packs. We are Jegson Innovative Industries involved in Research, Production and Supplier of unique human safe products mainly Eco Friendly Herbal Cosmetics, Herbal Home Cleaning Solution and our Patented vegetable and fruit cleaning solution “VEG FRU WASH”. These are produced under stringent ISO 22000, Haccp and CGMP certified facility. These are available to clients in convenient specifications and sizes. Our ultra-modern infrastructure facility is equipped with the latest production machines required for the manufacture of premium quality skin care and hair care products, apart from qualitative cleaning solutions for vegetables and homes. The incorporation of modern technology into our workforce helps us offer products of exceptional quality to our clients within the stipulated frame of time. Our client base has grown by leaps and bounds because of our commitment to the provision of premium quality products. Our products are stringently checked on various parameters of their quality to ensure complete satisfaction of the clients. Our products have witnessed high demand in the market. Our products are unique, purely herbal formulations and do not have any harmful chemicals or preservatives.